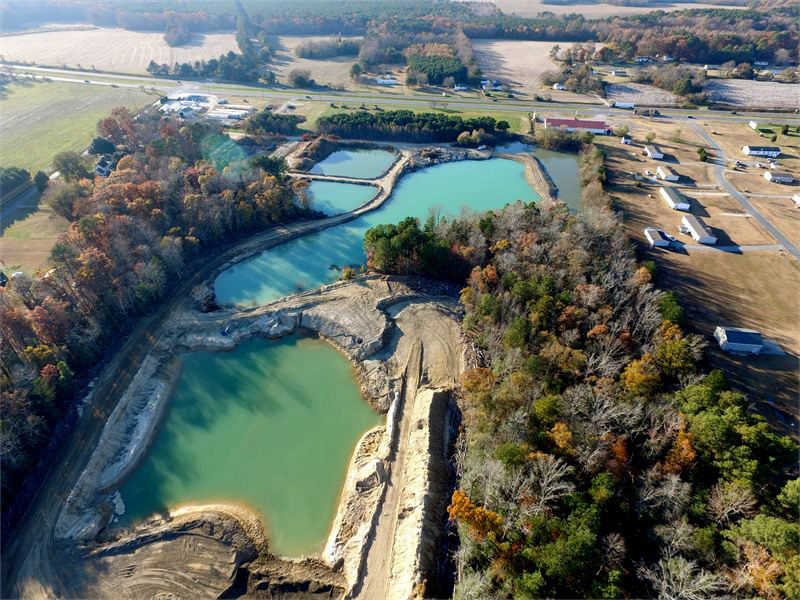 Eastern Shore Materials has applied for a Special Use Permit to expand the existing borrow pit, which is located just off Route 13 near Eastville, from 10 to 18 acres. The parcel is currently zoned Ag/Rural Business. The original pit was approved for use in 2016, with a 200 ft. vegetative buffer. This proposal wishes to have the 200 ft. buffer reduced to 100 ft. in areas that are along the highway. In 2004, the applicant was granted a permit through the Department of Mines, Minerals and Energy to operate an open pit sand mine. The mine is inspected annually, and the permit must be renewed yearly. The site has been in use for over 20 years as part of the applicant’s landscape business. According to the application, there are no plans to process sand or use sand processing equipment. The site is not part of the Chesapeake Bay Resource Protection Area. The Board of Supervisors will review the application at Tuesday’s meeting. Perhaps. Though it’s here. Depositing contaminated spoils, it is not going make the CBBT go away. Doing so, will potentially contaminate the sole source fresh water aquifer for foreseeable generations. While The Wagner Barrow Pit is not part of the Chesapeake Bay Resource Protection Area. It sits atop The Columbia and Yorktown-Eastover Multi Aquifer System Sole Source Aquifer, which encumbases hundreds of thousands of acres below land and beneath the Chesapeake Bay. The TBM used at the Chesapeake Bay Bridge-Tunnel will extract about 50,000 dump trucks worth of soil–tests have confirmed that the spoils will be contaminated by the boring process and must be disposed of in a protected landfill. The TBM requires the use of foams and other substances common to the oil-drilling industry. They lubricate the cutter head and help the spoils flow more easily. Most of the additives are petroleum based, and are considered hazardous. Those additives are petroleum-based, leaving the spoils tainted with contaminants considered hazardous to health. Measurement currently tally Total Petroleum Hydrocarbons, which are measured in milligrams per kilogram of soil. Environmental protection regulations kick in when TPH hits 50-plus milligrams. The CBBT samples – a mix of native ground and boring additives – tested at 75 milligrams of TPH, which is barely over the threshold. In heavily polluted sites, rates can climb into the 10,000 range. There had been speculation that the Wagner Pit and Webster Cannery might be considered as the spoils site, but as was reported in the Mirror, those sites “WERE” deemed ineligible due to concerns TPH could seep into groundwater. If there is renewed interest in the utilization of either or both sites, take heed before irreparably damaging the environment. Slide Easy…can’t agree with your assessment of CBBT being the worst thing to happen to the Shore. But, if so, as you say…it WILL be become the second worst thing to happen to the Shore if approval for spoils deposit and retention is granted to Eastern Shore Materials for storage of the tunnel boring project. People please wake up and look up the methodology they will be using on this project. The fluids used for the hydrology is not only very toxic and renders into the expunged soil (one tablespoon added to an Olympic sized swimming pool would render it unusable – Virginian Pilot, March 3, 2018 Headlined with New Chesapeake Bay Bridge-Tunnel Tube will Create a Mountain of Contaminated Soil). Do you truly want this in your backyard? This site is directly over the aquifer which supplies 100% of your water consumption. As Charles P. McWilliams wrote…google “Love Canal” or “Erin Brockovich” and I’d like to add look up pilotonline.com March 3rd issue Chesapeake Bay Bridge Tunnel Article and read that article, if you haven’t already. This is serious stuff. You need to be vocal to your elected offices to stand down on accepting the spoils. And as Easy says, THIS could make the CBBT stuff of nightmares. And for that, I agree with him. Note: The Mirror has published several articles on this. We also met with Mr. Wagner and discussed this issue at length. While Mr. Wagner, as well as others, were initially interested in the spoils, when it was discovered that the spoils would be contaminated by the tunnel boring process, they understood the Eastern Shore would not be a suitable location. It was soon determined officially by the state that the Shore would not be used for CBBT spoils. That, in a nutshell, is that. It should also be noted that Mr. Wagner’s pit has been approved for operation by the Department of Mines, Minerals and Energy for over 20 years. Eastern Shore Materials is one of the Shore’s best employers, and in conversation with Mr. Wagner, he told the Mirror, “We live here too…we farm, we fish, we don’t want to do harm any more than anyone else. We have always tried to do things by the book and with the least impact…”. The Mirror is sensitive to this issue because of a lack of due diligence in reporting issues involving this very same borrow pit. You can read Mirror articles on this here and here. Why would I want you to agree with me?